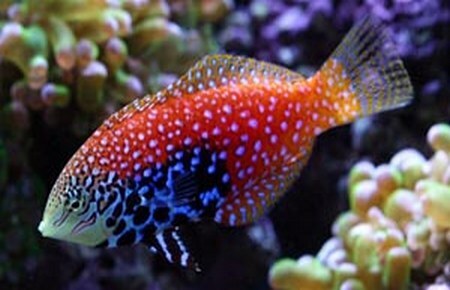 The Blue Star Leopard Wrasse, also known as the Vermiculite Wrasse, or Divided Wrasse, has a distinct colour pattern. The females or juveniles have a pearly white body with a combination of mottled oranges, yellows, and browns, with light blue spots found throughout the pattern, along with a large blue to black spot on their stomach. Do you know Macropharyngodon bipartitus by another name? Why not suggest we add it? How long do these guys hide for when you first get them? I have had mine 5 day now and it never comes out!!!! !